Fall under the spell of the enchanting Amalfi coast where one of the most beautiful coastline in the world offers incredible views throughout its course. Your day tour of the Amalfi Coast begins from the Port of Naples and travels along the scenic areas by the Bay of Naples, passing Mount Vesuvious and the stunning view of Capri. We will stroll up the Mountain side of the Natural Park of Lattari where you will be enchanted by small hill top towns and beautiful vineyards before arriving on the Amalfi Coast. We will stop at the very top of the mountain for a seaside photo opportunity. 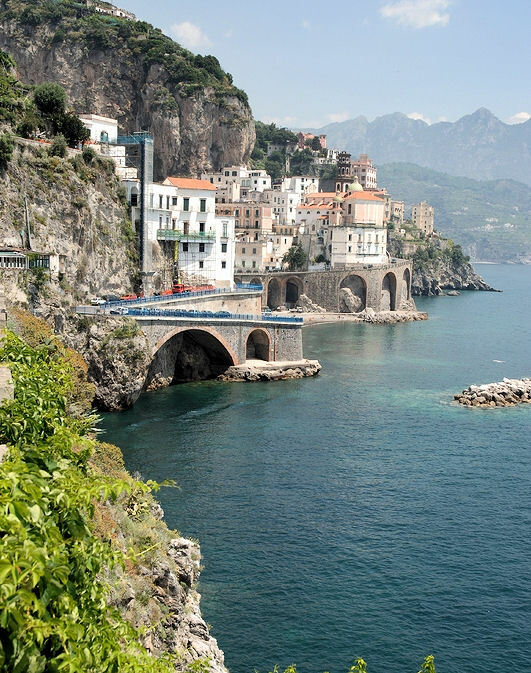 The first town you will visit is the town of Amalfi. Strolling through the streets of Amalfi you will feel the history as the locals enjoy a prestigious past of this major naval power. Made of a labyrinth of narrow lanes and alleyways that climb the surrounding hills, the town features typical Mediterranean style architecture with houses piled one on top of the other. Here you will visit the celebrated Paradise Cloister built in Arabian style that dates As well as the Duomo of St. Andrea built in the 10th century. We will pass many historical parts of this long whimsical highway, the First Fisherman village in Conca dei Marini, Vietri sul Mare, one of the jewels of the Amalfi Coast, internationally famous for its pottery and Praiano, known for its roadside presepe (Nativity) handcrafted by Michele Castellano, literally built into the natural rock wall. We will continue forward around the narrow alleys of Positano from above the unsurpassed position along the Amalfi coast where delightful white and pastel-colored houses litter the hillside. You will experience this town from the top of the cliff, as large buses cannot enter the lower area of this town. The last stop will be Sorrento, the home of Luciano Pavarotti that dates back to 600 BC and has incredible views along the high cliffs above the Tyrrhenian Sea. We will pause there for the afternoon, strolling down Via San Cesareo where the streets are filled with all of the famous Sorrento goodies like limoncello, Wood craftsmanship products and Cameo & Corral shops. After a relaxing day on the Amalfi Coast, we will head back to the Port while passing the Bay of Naples.